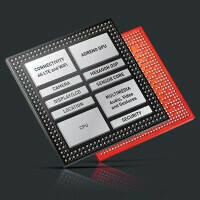 The Qualcomm Snapdragon 615 processor is the piece of 64-bit silicon we'll most likely encounter in the "almost flagship" smartphones that will appear on the market before the likes of Samsung, LG, HTC, and Sony are ready to present their most important offerings in the first half of 2015. By "almost flagship", we mean devices from the "upper mid-range" category, which are reasonably advanced in terms of hardware, but usually aren't representative of their manufacturers' latest breakthroughs in design and technology. There are exceptions to the rule, of course, but for the most part, that's the upper-mid range smartphone for you. That aside, what makes the Snapdragon 615 processor special? Well, it brings forth the industry's first octa-core 64-bit CPU architecture with integrated Cat. 4 4G LTE. Made on a 28nm process, the CPU is formed by a combination of four 1.7GHz ARM Cortex A53 cores and four 1GHz Cortex A53 cores, paired with the Adreno 405 GPU, a Hexagon V50 modem and app DSP, and Qualcomm's Quick Charge 2.0 tech among other goodies. While the processor is no performance beast, it packs enough punch to deliver precisely half of the 32-bit Snapdragon 805's performance while staying energy-efficient. This is enough power for everything, short of the most demanding 3D games and emulators. So what are some Snapdragon 615-powered phones? We've rounded up six of them, mostly new and coming. Aside from the fine processor we're talking about, they stand out with design, features, and reasonable prices. The Oppo R5 is most famous for its impressively thin 0.19in (4.85mm) profile and controversial lack of 3.5mm audio jack. But engineering chops aside, the phone can boast about having Qualcomm's 64-bit Snapdragon 615 octa-core processor at the heart of its operations. Oppo's homeland rival, Vivo, went even further in slimming down the Android smartphone. It ended up with a crazy-thin profile of just 0.15in (3.98mm) at its thinnest point and 0.18in (4.75mm) at its chubbiest, and still managed to fit a 3.5mm audio jack and two SIM slots inside. This marvel of engineering is also powered by the Snapdragon 615 64-bit octa-core processor. The Vivo X5 Max will be launched on December 22 in China. French vendor Archos lined up a new high-end smartphone, called the Archos 50 Diamond. It's outfitted with a 5-inch 1080p IPS display, a Snapdragon 615 processor, 2GB of RAM, 16GB of expandable storage, a 16MP rear camera, LTE connectivity, dual SIM support, and a 2700mAh battery. The device measures 5.74 x 2.77 x 0.31in (146 x 70.4 x 8 mm) and weighs 5oz (142 grams). HTC's upper mid-ranger phone is one of the Taiwanese maker's best Desire phones to date. It has a 5.5-inch display with the low, but decent 720p resolution, and it's powered by - you guessed it - the Snapdragon 615 64-bit processor, paired with 2GB of RAM and 16GB of expandable storage. It also has a flashy 13MP camera and it's powered by a 2600mAh battery. In addition to potent silicon, the phone has charming colorful looks and HTC's special-touch - the DotView case. The Coolpad GreatGod F2 was summoned to battle the best-selling Xiaomi Redmi with a 5.5-inch 720p display, 64-bit Snapdragon 615 processor, 2GB RAM, 16GB of storage, 13-megapixel F2.0 rear cam, and looks borrowed from Meizu. If you plan to hunt around for the $163 smartphone, make sure to get the China Unicom version, which has the Snapdragon 615 processor. The other version runs on a MediaTek SoC, which is similar in power, but it won't talk to mobile networks outside of China. This upcoming Samsung Galaxy phone will introduce an all-metal design, a signal that Sammy will finally abandon cheap plastic for its high-end devices. At this point, it's assumed that the Galaxy A7 will use either Samsung's Exynos 5433 SoC, or Qualcomm's Snapdragon 615 processor, or both. In any case, it will be a solid 64-bit smartphone. In addition to that, the A7 will most probably have a 5.5-inch 1080p screen, 2GB of RAM, a 13MP camera, a 5MP front cam, 16GB of storage, and a 2600mAh battery. A price and launch date for the Galaxy A7 are yet to be revealed. so how this adreno 405 compared to adreno 320? Seems to me the 320 is better as on the offscreen it wins the most 4-2 and in some big time. But this should go into mid range phones right so that is pretty awesome. 320 is sligthly better, but in the two most important tests: 1080p Manhattan Offscreen & 1080p T-Rex Offscreen they are on par, each winning one of them. So in general the users won't see a big difference. I really hope so. now they only have to make a tablet size phone around 7-8inch with stereo speakers and im in for a midrange phone. I got a z3tc as phone because of its size and speakers but use the z2t more for series and games. really nice to see that. so will low end and mid range phone will use it? More like mid to mid-high range. Ye cause android apps and games are all moving to 64bit. Good joke. You wont need a 64bit android phone for at least 1-2 years. It will change if there are enough phones have 64bit chips in them. And also phones with 64bit will be usable for longer. Some people buy 1 phone for more than 2 years. And some (like me) sell their phones in 1-2 years. The buyer could enjoy their phone for a longer time. lol! Coolpad "Great God" F2 o.O? Had to double google just to be sure. Same codename? So this F2 is the continuation eh? How's Coolpad custom ROM scene this time of year? 64 and half the output of the current 32 top dog? So more with less? I bet S800 is still competitive to it then, a much older soc that is just as fast as new stuff, looks like Qualcomm is unloading lesser soc to clear its supplies out. i have aquestion here my exynos note 4 appear to have armv7 on antutu not amv8 although according to phonearena the exynos 7octa (5433) is amrv8????????????????? Noob here. Where's the advantages of having 64bit processors instead of 32? It apparently provides more accurate decoding or something like that.